Show of hands, how many of you non-Malay readers are able to converse in Bahasa Melayu? And by that we mean hold a proper conversation, not just being able to count to five. Chances are not so much, right? How would you feel then, if you had been made to study it as a third language back – or currently, for our student readers – in school? Because according to Workers’ Party’s Chen Show Mao’s Instagram post on Wednesday (14 Mar) , everyone should be able to at least converse in the language. Do students already have enough on their plates? Or could he perhaps be on to something here. 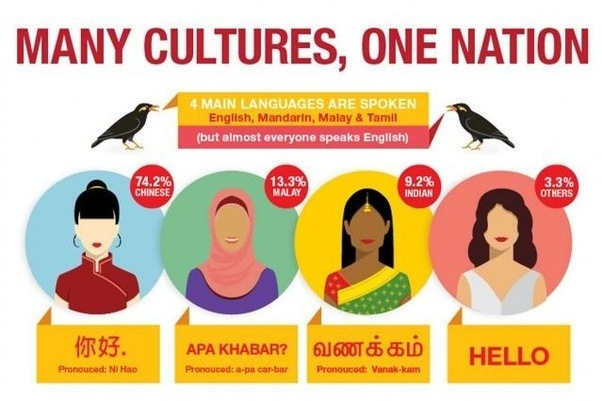 Given how Singapore was formed, the Malay language has always been prominent in the country — what with it being our national language and all. 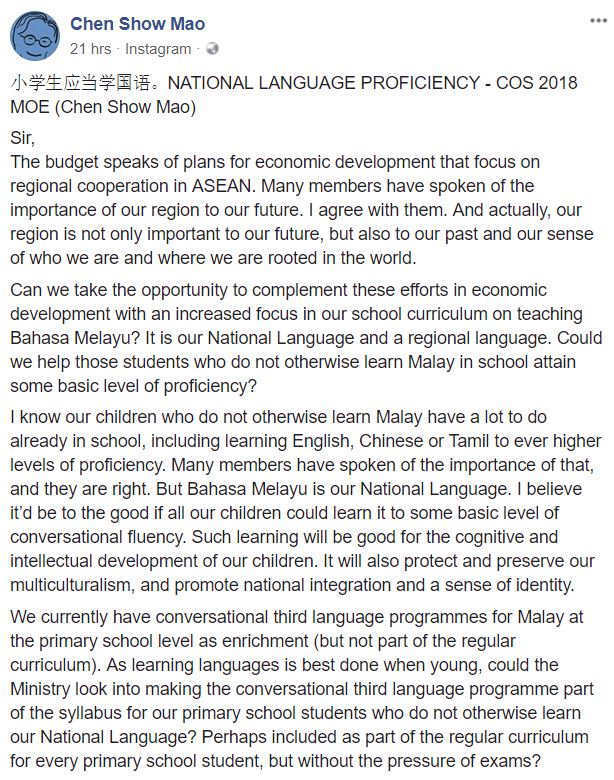 Which is why – considering it’s also a regional language – Mr Chen is calling for schools to include Bahasa Melayu as part of the primary school syllabus for for all students. In case you can’t read it, here’s what he wrote. Without the exams of course, students these days already have enough to worry about. 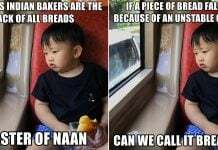 Though if you think about it, Singapore has to be one of the few countries where majority of its population isn’t able to speak its national language with reasonable fluency. 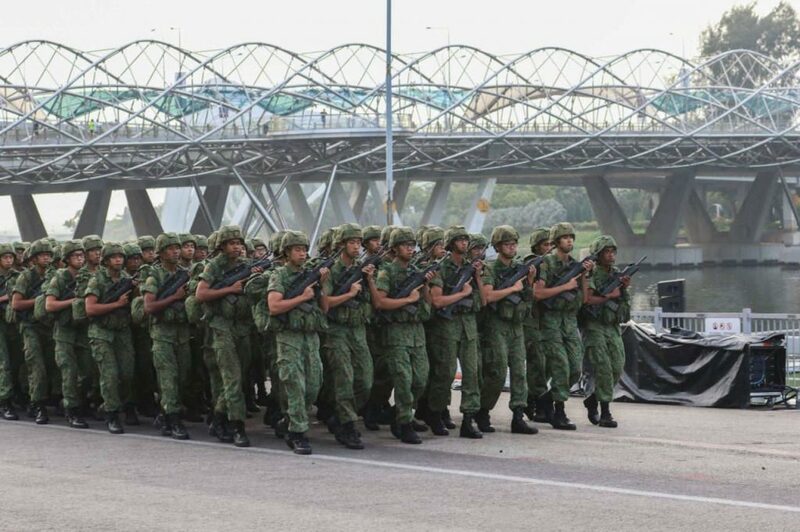 However, considering how our National anthem, pledge, and even SAF marching commands already utilise the language, is really doesn’t seem like that much of a stretch now does it? Soldiers, stand at ease. Huh? 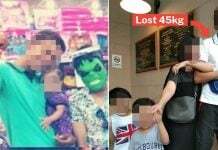 Senang Diri la. Ohhhh. 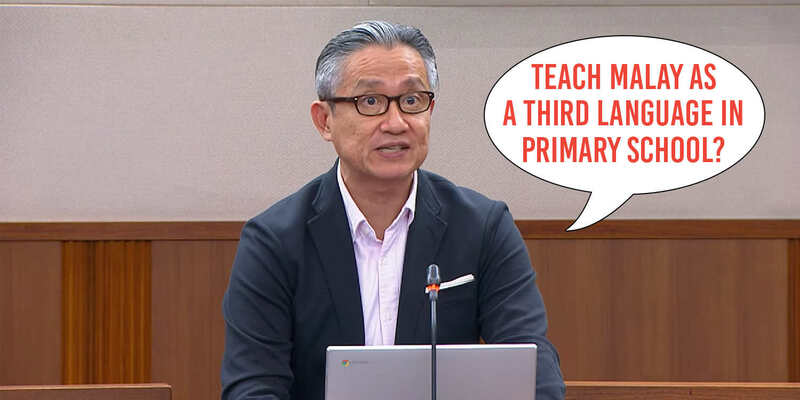 After all, Mr Chen believes that doing so would actually be good for the cognitive and intellectual development for the children of Singapore. Not to mention preserve Singapore’s multiculturalism, promote national integration and maintain a sense of identity as well. Could we help those students who do not otherwise learn Malay in school attain some basic level of proficiency? And added that various members of ASEAN have already agreed on the importance of doing so. Mr Chen gave a shoutout to existing enrichment programmes involving “conversational” Malay at a primary school level. Then called on the Ministry of Education to consider making them a part of the syllabus for our primary school students, without the pressure of exams. What do you think of Mr Chen’s suggestion? Thus far, it seems that reception to his post has been largely positive. With one even supporting his stand that learning the Malay language would help improve relations with our neighbouring countries. Given how almost all of us are already bilingual, could we be seeing Bahasa Melayu taught to non-Malays in the future? Besides, we’re already so familiar and comfortable with the language already as it is. Do you think Singaporeans will be able to handle speaking a third language? While it is true that students already have a lot to do in school, do the pros outweigh the cons in this case? And yes, we’re keenly aware that most of us Chinese can barely speak our mother tongues fluently as it is.